Thomas Sidney Watts was born in the 1st quarter of 1897 in Camberwell, London to fish salesman Walter Wordsworth Watts and Elizabeth Emmeline Watts nee Traynier/Trayner. 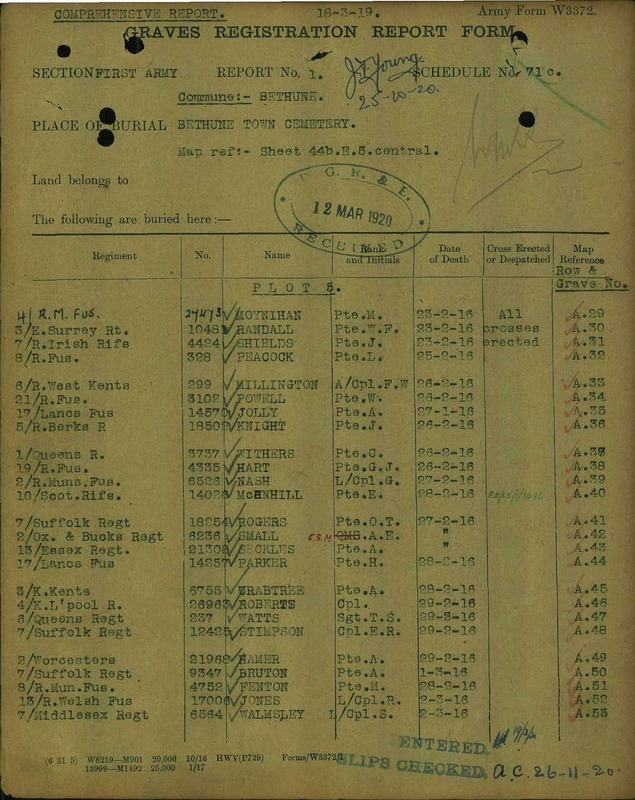 At the time of the 1901 Census, the family lived at 2 De Crespigny Park, Camberwell, London. Walter was still working as a fish salesman and Elizabeth was at home. 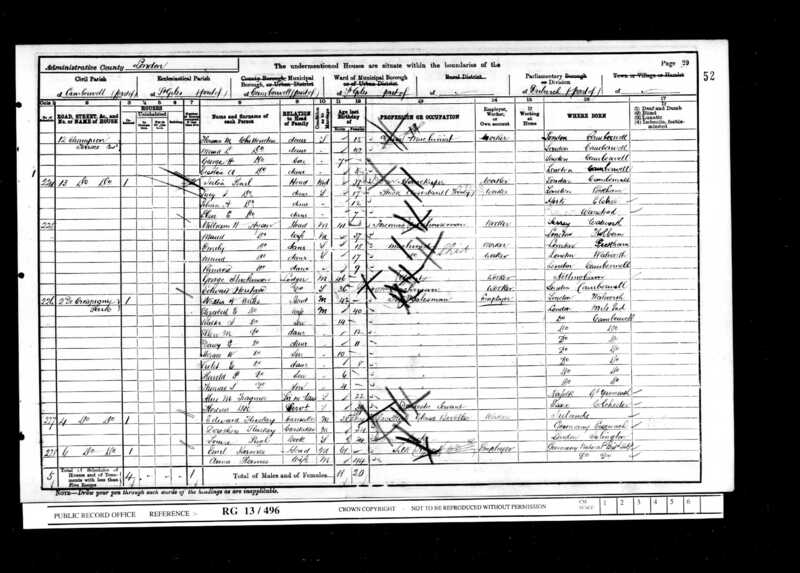 The household further comprised of their children: Walter, Ellen, Daisy, Horace, Violet, Harold and Thomas. The family was looked after by a domestic servant. 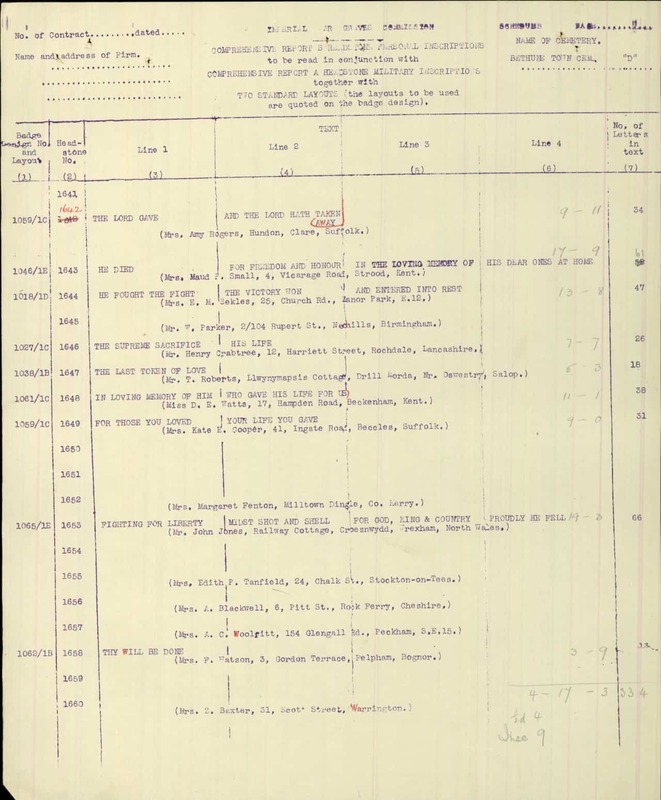 At the time, Mr Watts’ sister in law Alice M. Traynier was visiting the house. Thomas’s mother Elizabeth died in the 2nd quarter of 1904 in the Registration District of Camberwell, London. 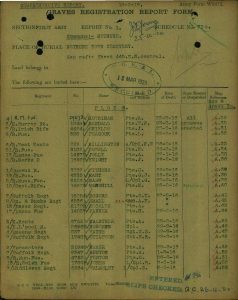 At the time of the 1911 Census, the widowed Walter was still dealing in fish, and the family were still living at the same address in Camberwell. The family further comprised of his children: fish salesman Walter, shop assistant Horace, Violet Emmeline, petty cash clerk Harold, Thomas and Norman. Walter stated that he had eight children. The house had ten rooms. 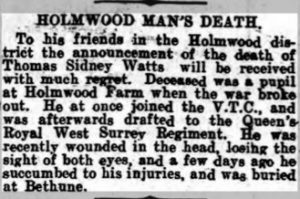 Thomas Sidney Watts enlisted in Guildford, Surrey into the 6th Battalion of the Queen’s Royal West Surrey Regiment. 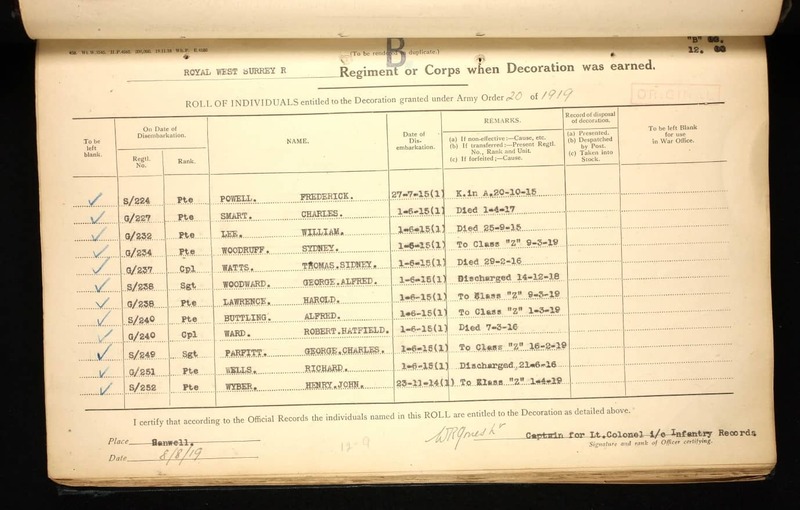 He was a Private with regimental number G/237. 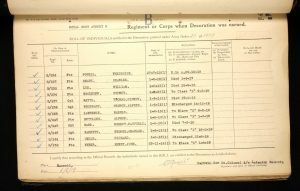 At the time of his enlistment he lived in Beckenham, Kent. 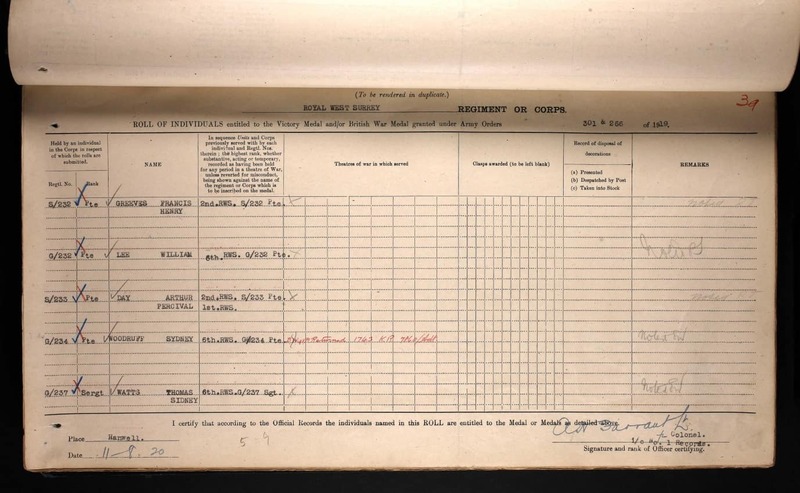 He disembarked on the 1st of June 1916 in France. At the time of his death he was a Sergeant. 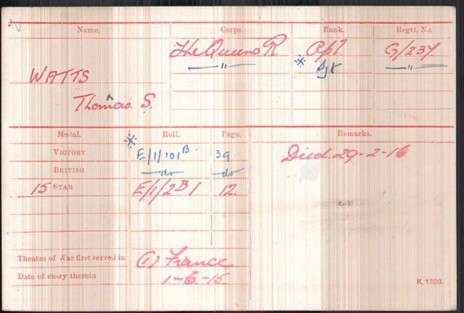 Thomas died of wounds on the 29th of February 1916 in France. 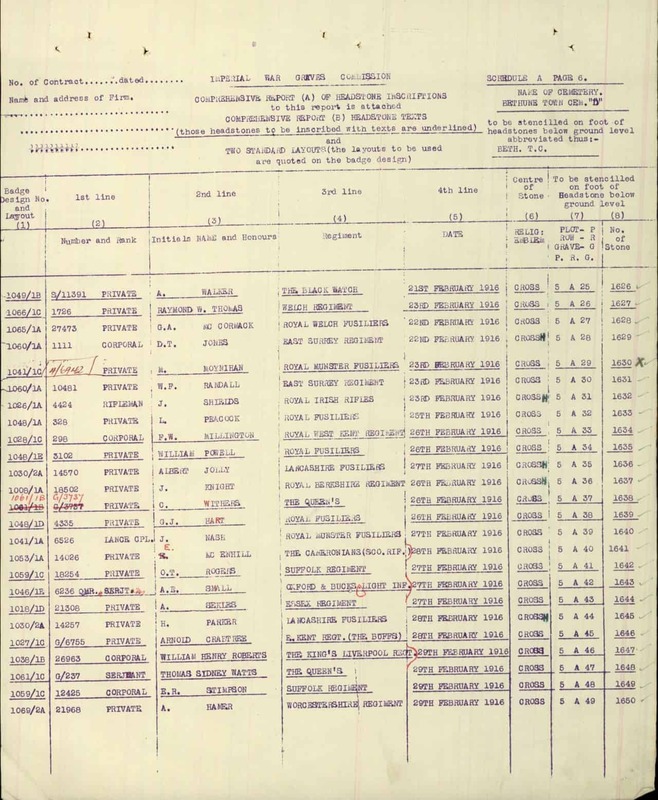 Thomas was buried at the Bethune Town Cemetery in France. His grave reference number is: V. A. 47. Thomas’ headstone erected by his sister Daisy, reads: ”In Loving Memory Of Him Who Gave His Life For Us”. Daisy lived at 17 Hampden Road, Beckenham, Kent. He received the British War and Victory medals and the 1915 Star. 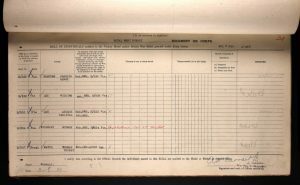 Daisy received £8, 9s and 5d on the 2nd of June 1916 and a further £9 and 10s on the 16th of August 1919 in Soldier’s Effects. Thomas’ father Walter Wordsworth Watts was born on the 15th of February 1859 in Camberwell; to fish merchant John George Watts, born about 1826 at St Saviours, Southwark, Surrey and Maria Watts, born about 1825 in Dagenham, Essex. Walter was baptised on the 9th of March 1859 at St George’s church in Camberwell. 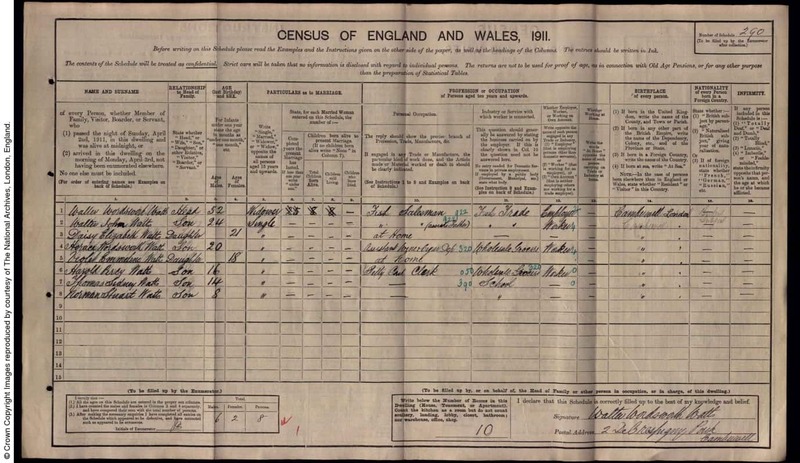 At the time of the 1881 Census, Walter was working as a fish salesman. 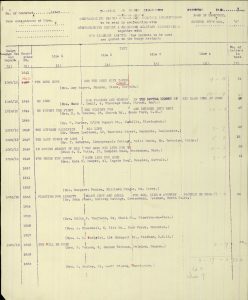 His mother Elizabeth Emmeline Traynier/Trayner was born about 1860 in London, Middlesex to fishmonger Anthony Francis Traynier/Trayner, born about 1831 in Middlesex and Elizabeth Angier, born about 1837 in Middlesex. Elizabeth was baptised on the 21st of October 1860 St Anne’s church, Limehouse, London. 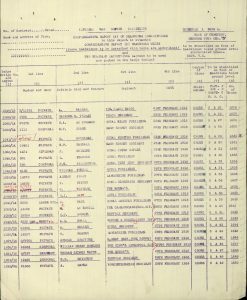 At the time of the baptism the family lived in Globe road, Tower Hamlets, London and Anthony was working as a light man. 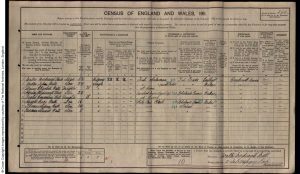 Walter and Elizabeth married, by Banns, on the 2nd of June 1886 in Great Yarmouth, Norfolk. At the time of their marriage Walter lived in Camberwell. Elizabeth lived in Great Yarmouth, Norfolk. 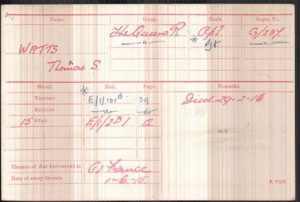 Thomas had seven siblings: Walter John born about 1887; Ellen Mary born about 1889; Daisy Elizabeth born about 1890; Horace born about 1891; Violet Emmeline born about 1893; Harold Percy born about 1895 and Norman Stuart born about 1903, all in Camberwell, London. 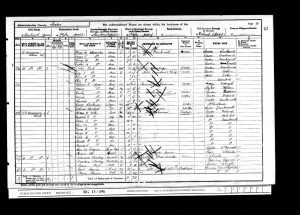 At the time of the 1891 Census, the family lived at Eldon Villas, Peckham Road, Camberwell. Walter was working as a fish salesman and Elizabeth was at home. The household further comprised of their children: Walter, Ellen, Daisy and Horace. The family were looked after by a nurse and a general servant.